Arabica Coffee Garden Tourism object belongs to BUMN PT Perkebunan XXVI; it is 4,000 hectares, and 900 heights from the bottom of the sea. It is about 57km east of Bondowoso town. The guest can watch and enjoy beautiful scenery. 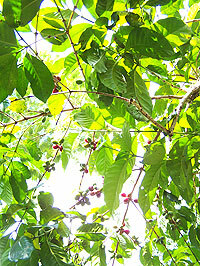 Besides enjoying the Arabica coffee, the tourists have several other facilities to enjoy at the plantation. The guests can enjoy the roses and lilies in the flower garden and can enjoy recreational fishing at the fishing arena. There are also meeting rooms, a tennis court, and a swimming pool. The guesthouse at Jampit I, Arabica home stay / Jampit II is also equipped with fireplace rooms. Entertainment programs as well as arranged coffee breaks are available. The wide land can be used as the place for bicycle rides and a car tour.